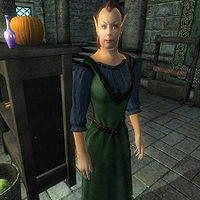 Elsynia is a Bosmer trader at Best Goods and Guarantees in Leyawiin. She sells general goods and the unique Nistor's Boots. Elsynia lives the life of a typical merchant. Her day starts at 6am when she roams around the main trading room before the store opens at 8am. For the next 12 hours, Elsynia and co-proprietor Gundalas offer their various services to customers before closing up shop at 8pm. If the weather is clear, Elsynia spends the evenings strolling around outside, in the area between the store and the Chapel. On rainy days she will skip her outing completely and stay inside. Elsynia was supposed to sleep on the second floor between midnight and 6am but doesn't due to a bug. She wears a blue and green outfit with a pair of quilted shoes. She carries the key to the store and a paltry amount of gold. Due to a bug Elsynia will not go to sleep, she will try briefly at midnight but give up and wander around the shop floor.